Mexican restaurant in Market Square. if you ask me, and I love that we blend right in! Walk in love, as Christ loved us and gave himself for us, an offering and sacrifice unto God. This last week in San Antonio was fruitful. I had an opportunity to spend a good bit of time with two people important to EPF — Harry Gunkel and Rev. Will Wauters. Harry is responsible for our Palestine Israel Network activities and Fr. Will is a past NEC Chairman. Both showed Steven and me amazing hospitality and graciously spent time sharing their passion for our work. Fr. Will is currently the Vicar at Santa Fe Episcopal Church in San Antonio. We met at the church for a few hours and he shared two wishes for EPF’s future: first, that we would recommit to focusing on efforts to bring about nuclear disarmament; and second, that we would renew our energy for environmental justice. I concur, and with this note ask any and all with passion for these missions and connections to impactful organizations with which we might partner will reach out to me. We have a history of good work for these issues and can easily mobilize to make an impact again. Let me hear from you, please! Santa Fe is one of those small, yet mighty, parishes that does a whole lot of good with very few resources. Just by way of one example, Fr. Will and the parish were responsible for identifying the fact that many of the social ills afflicting their community were caused by the lack of access to decent wages. They organized a public-private consortium and raised $6 million dollars to start a skills training project that is now self- sustaining and is responsible for raising wages and the standard of living. If you are in San Antonio, visit this inspiring parish, and see what can be done with a little thoughtful reflection and a whole lot of prayer and hard work. 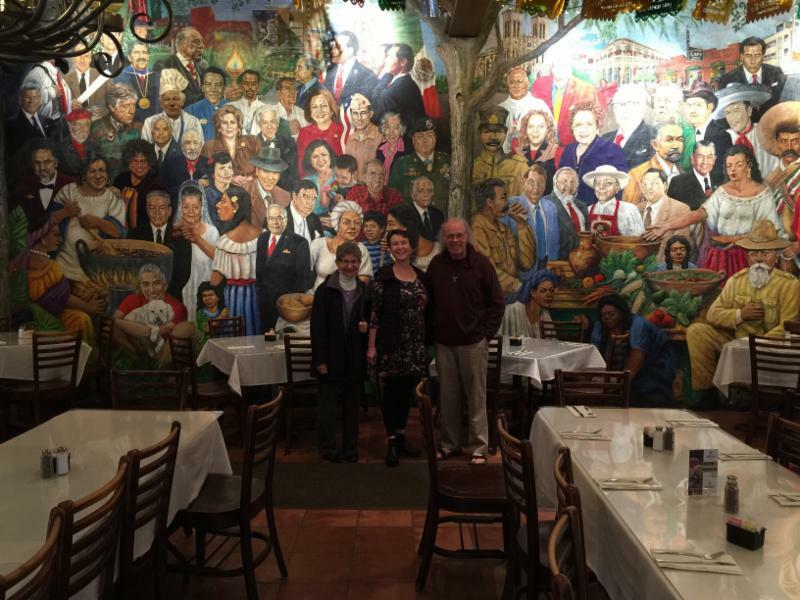 San Antonio is an amazingly compassionate city. Fr. 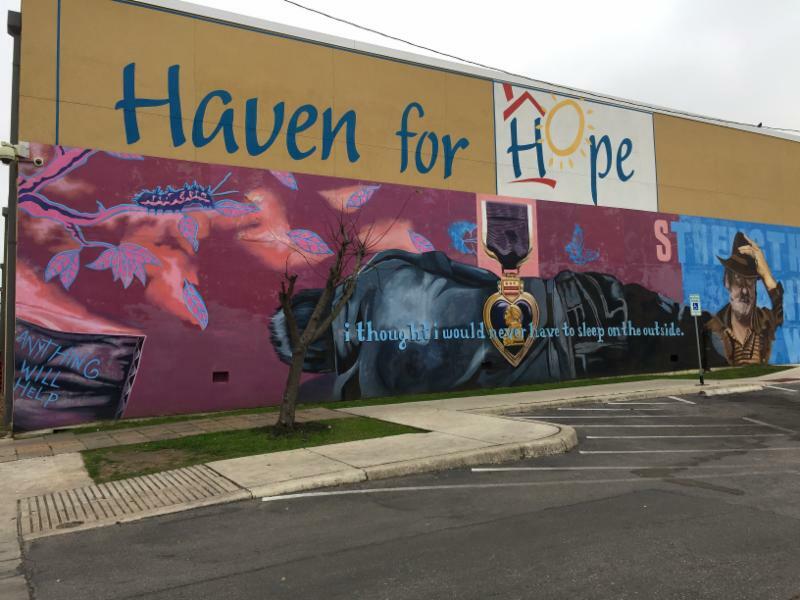 Wauters took us to see Haven for Hope, a community created for the care of the county’s homeless citizens. www.havenforhope.org. Social services and health care and other resources needed by this vulnerable population are all located on the campus, including a kennel for pets. I wish every community could replicate this model. The podcast featuring Steven and me and missingpersonsrv finally dropped. 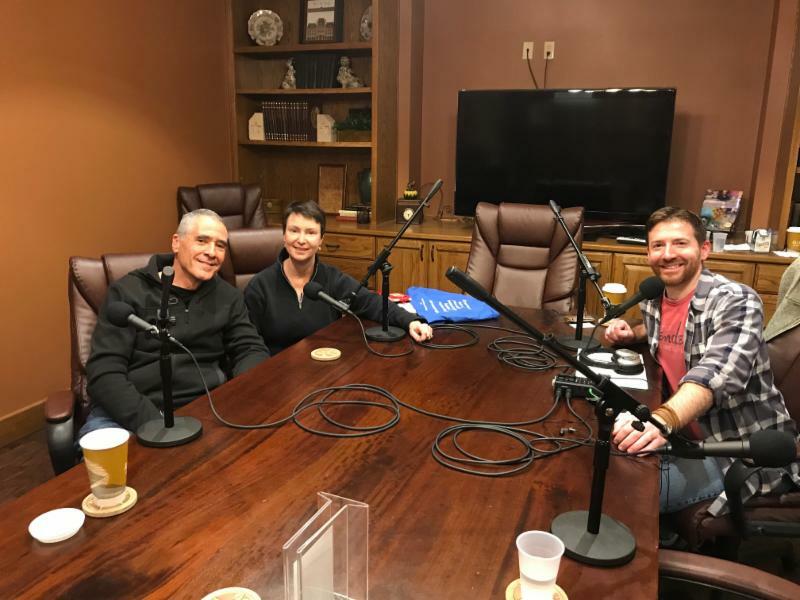 You can listen to both parts of our interview (part one deals with collaborative law work, and part two features EPF and our life with Miranda.) Check it out at www.shilohcoleman.com or search for #purposeintheprocess @applepodcasts @spotify or @google. Thank you Shiloh Coleman, collaborative lawyer in Austin, for having us on. EPF member Bill Graham in Danvers, MA sent us this lovely peace offering. Last autumn, the Danvers Middle School students participated in the annual Lions’ Peace Poster Contest. The artwork from 11-13 year olds was amazing. The theme was “Kindness Matters”. The top dozen were all displayed at the Martin Luther King day event put on by the town’s diversity committee. 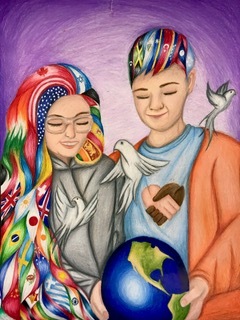 This art is by First Place Winner Kailey Bettencourt. 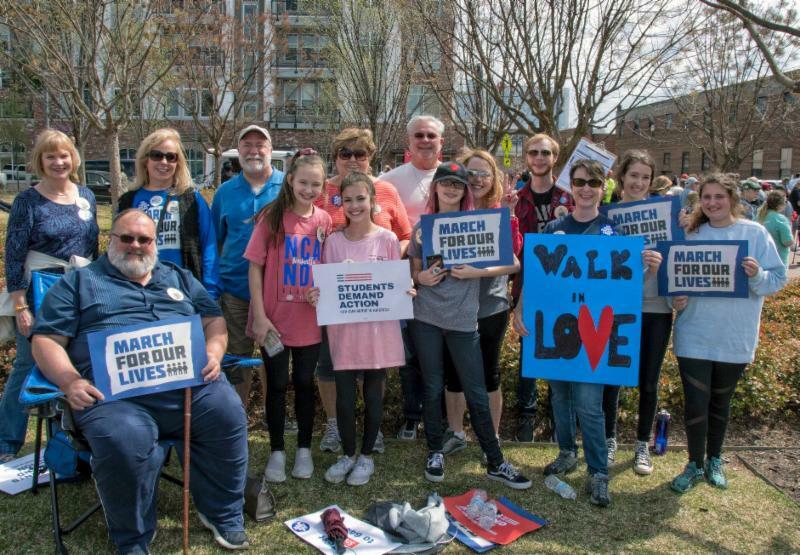 Get ready to Walk In Love in April! We are still working on details for our Columbine pilgrimage to commemorate that horrible massacre which happened twenty years ago, and to rededicate ourselves to eradicating gun violence. This will be our first Year of Action event for 2019. I hope all who are reading this and who are concerned about gun violence in our culture will try to attend (April 26-28 in Denver). Details and registration soon at https://give.classy.org/epfcolumbine. 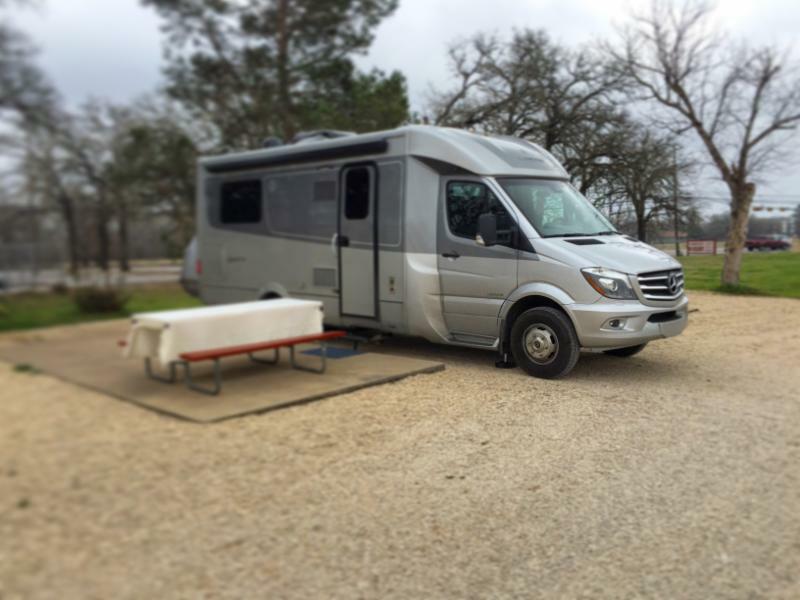 I am writing this post from charming Fredericksburg, Texas. We spent the last weekend in Aggieland with family, and worshiping at St. Thomas-College Station. We enjoyed a stop in Johnson City yesterday and had a chance to remember some of what LBJ did to advance health care, civil rights, and environmental protections, and to erase poverty. We will be here for a couple of days before we head up to San Angelo. If only I could be in all places! Our Peace Partners in Pensacola, Florida are taking a pilgrimage to Africatown March 9-10, 2019. http://bridgethegulfproject.org. If you are in the Gulf Coast area, you won’t want to miss this. Make Pilgrimage reservations with Bill Sloan, wmsloan35@gmail.com, 850-748-2314. In March I will be in Chicago for the Palestine Israel Network Retreat from March 14-18. Here’s hoping that Punxsutawney Phil was right and the weather moderates soon! Want a visit? Let me know! Rev. 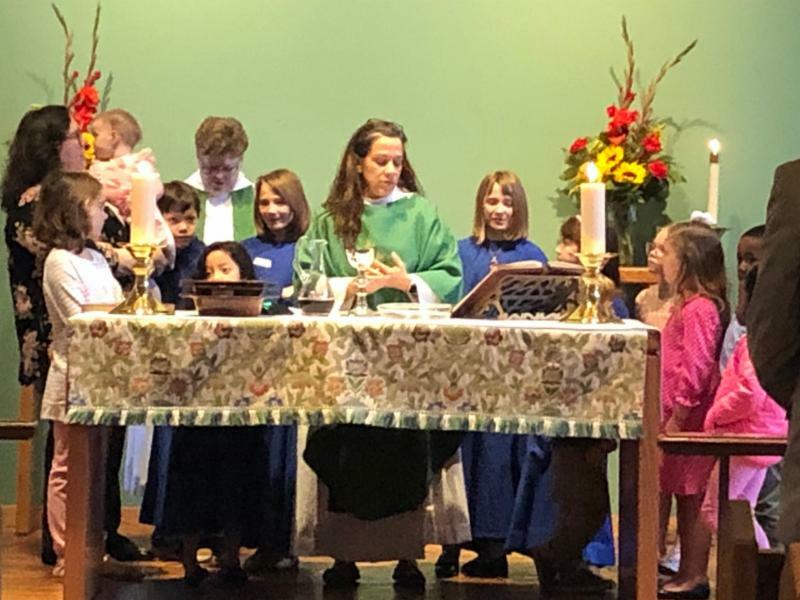 Angela M. Cortinas of St. Thomas – College Station celebrates Holy Eucharist surrounded by the children of the parish on the first Sunday of each month. It’s a holy sight to behold! Miranda, our RV, is repaired! Thanks very much to Harry Gunkel for letting us hang out with him in San Antonio while we waited for her window to arrive.